Palm Desert, Calif. – The OC Sox squad sure was happy pitcher Eric Orue decided to fly across the country on Martin Luther King weekend to compete in the Desert Classic. 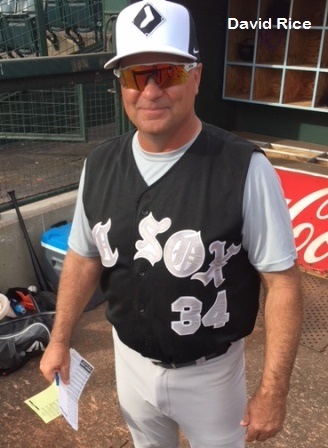 Orue came into the ballgame in the seventh inning and pitched three shutout innings to record the save, helping the OC Sox defeat the Las Vegas Bears 5-4 for the Men’s Senior Baseball League 35 American championship at the College of the Desert. Orue, who also added two RBIs on the offensive end, played for the Sox before moving to North Carolina. Despite the distance, Orue was anxious for a Sox reunion in Palm Springs. With the score tied 4-4 in the top of the seventh inning, Cobi Cradle walked, stole second and scored the winning run on an RBI single from Scott Bibee. The Las Vegas Bears were within striking distance with two runners on in the eighth inning, but manager Mauricio (Mo) Molina grounded out to end the rally. The Bears also had a runner on in the ninth but couldn’t capitalize. The Sox finished 5-0 in the Desert Classic. They also won the tournament in 2008 and advanced to the finals in 2010 before rain cancelled the game. However, Sox manager David Rice said this year’s championship meant a lot more. Cradle also had a big game for the Sox, finishing with a double, single, stolen base and a run scored. Scott Field, John Alloway, Adam Gonzalez and Tony Zavala also scored for the Orange County squad, which scored one run in the first inning and three in the third before the winning run in the seventh. The Las Vegas Bears, who finished 4-1 in the Desert Classic, were led by Drew Vertes. He tallied three runs (one as a pinch runner) and added two hits, including a triple. Kory Sagers scored the other run. Steve Johnson finished with two hits and an RBI while Scott Hannish added an RBI. Scott Bibee recorded the victory for the Sox, allowing two runs in five innings while striking out two. Rice credited the tournament victory to exceptional play all-around. WP – Scott Bibee. LP – Scott Hannish. Top Hitters (OC) Cradle 2×3, run; Rice 2 RBI; Buster Niezke 2×4; Bibee 2×4, RBI. (Las Vegas) Vertes 2×4, 3 runs; Steve Johnson 2×4, RBI; Hannish 2×4, RBI; Sagers 2×4, run. Molina 2×4. 3B – Vertes.